There is an established and growing shortage of family and consumer sciences professionals to serve in educator positions in secondary education, higher education, and Extension education. This shortage increasingly results in educator positions going unfilled or filled with unqualified individuals. Shortages of family and consumer sciences educators and those enrolled in family and consumer sciences educator preparation programs too often result in program closures. Issues and possible strategies impacting resolution of the family and consumer sciences educator supply/demand imbalance was the focus of Filling the FCS Educator Pipeline: Summit for Action! during the 2015 AAFCS Annual Conference & Expo. 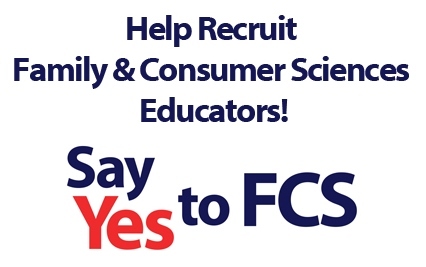 "Say Yes to FCS: Filling the Family & Consumer Sciences Educator Pipeline" is the resulting national educator recruitment campaign being led by the American Association of Family & Consumer Sciences (AAFCS). Building on the Summit's foundation of collaboration and cooperation, AAFCS is working with other stakeholders to develop and provide access to campaign resources and tools, while also promoting campaign engagement and impact through AAFCS communication networks. The campaign is designed to support and advance existing educator recruitment initiatives and provide models and assistance for new efforts. Use of "Say Yes to FCS" branding shared by a number of current campaigns is intended to promote national recognition, maximize impact, and underscore unity and collaboration of efforts. This website is a compilation of information and resources intended for shared use by all family and consumer sciences educator recruitment initiatives. Some of the resources will be self-contained on this website, while others will be available through links to the work of other like-minded family and consumer sciences educator recruitment efforts. For more details, access the campaign background piece. Webinar - "Say Yes to FCS - Taking Bold Steps to Fill the Family & Consumer Sciences Educator Pipeline"